“Medicine is gray. It is rarely black or white,” conceded Dr. Maher Tabba, the fellowship director at a local teaching hospital. We were discussing a challenging medical case. A patient’s diagnosis eluded Tabba and his team. He sought certainty. But like so much…..informed instinct combined with knowledge and experience would have to lead the way. Dr. Tabba’s willingness to process out loud his struggle to reach a conclusion touched me. Was it because I’d been through a similar progression in my transition? If I’m honest in the early stages of my transition I only partially sought an answer to the question of ‘what’s next?’ Don’t get me wrong. I asked questions. But exhaustion, or the sheer enormity of it all, dulled my ability to really ask and answer. Interesting? It took almost a year for me to decouple ‘me’ from ‘what other people valued in me.’ After more than twenty years of a career and a very full life I found this exercise difficult. Try it. Strip away all the affirmations that so many have bestowed on you over the years. What is left? Do you recognize this person? Do you like this person? Does she share your passions? What makes her smile? Another woman from the Research Jam Focus Group offered a story about a barrier she encountered in transition. She had long had an interest in studio art. To pursue her interest she surrounded herself with what she believed to be necessary. Pastels. An art teacher. Upon reflection she noted that there always seemed to be something more she could do to get ‘ready.’ More materials to buy. An unexpected hold due to a cancelled class. My transition started in 2010 when I left full-time employment. In the beginning my transition objective was to find work that would fit what I’d refer to now as my distorted self. A self that was an accumulation of dear things, like children, and not-so-dear things like other’s expectations or chronic fatigue from decades of 60+ hour work weeks. My transition started in earnest a year later when I gave myself permission to ask broader questions. What I valued? My passions? My dreams? It also triggered a series of experiments…this blog being one of them. Dr. Tabba used experiments to direct his course of action amidst great uncertainty. Could experiments be a catalyst for you? What might come next if you gave yourself permission to reach? 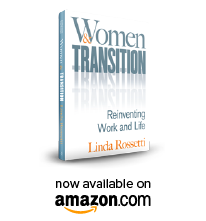 This entry was posted in Observations on Transition and tagged career transition, Herminia Ibarra, linda rossetti, Transitions Making Sense of LIfe's Changes, William Bridges, women's transition, women's transition issues, Working Identity. Bookmark the permalink.